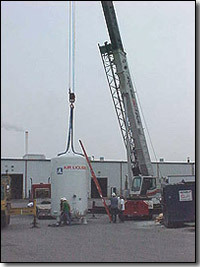 Bulk Gas Installations - Indianapolis, Indiana - Sutton-Garten Co.
Sutton-Garten can provide bulk gas installation for bulk argon, oxygen, nitrogen, carbon dioxide, helium and mixed gas systems for higher volume applications. Cryogenic or refrigerated bulk tanks provide safe outside storage of gases which can be piped to use stations inside your facility. 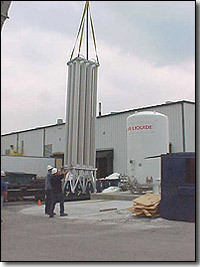 Cylinder handling is totally eliminated, and it results in a safer workplace and much lower overall cost for your gases. Volumes required to use bulk gas vary with the gas, but once your use reaches approximately 10 cylinders a week, it is time to call us for some cost comparisons.